Blackfire Glass Cleaner is a streak-free glass cleaner that is tint safe and ammonia-free. This superior glass cleaner uses a powerful yet gentle formula to clean all glass surfaces safely and effectively. 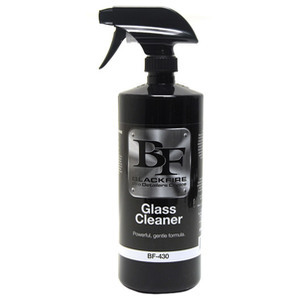 Blackfire Glass Cleaner gently removes dirt, debris, smoker’s film and other surface contamination from your glass. Do not use on glass that is hot to the touch. Spray glass cleaner directly onto glass. Wipe clean with a microfibre glass towel. Use a second clean, dry glass towel to buff the glass to a streak-free finish.